A cocktail worth $1,000 (or even $2,500) better have a damn good backstory. The Mint Julep from Woodford Reserve certainly qualifies. Officially dubbed the Woodford Reserve 2019 $1,000 Mint Julep, the four-figure cocktail is only available in limited quantities at this year’s Kentucky Derby, the 145th running of the classic horse race. So a thousand bucks is — to borrow some betting-the-horses lexicon — an exotic wager. But what makes the cocktail special is two-fold: The julep utilizes fresh-mint grown on the grounds of the Churchill Downs racetrack, along with an “inspired” sweetener crafted from honey sourced from a local Kentucky farmer that was then laid to rest in a small oak barrel for 145 days inside the racing ground’s iconic Twin Spires. Most importantly, proceeds for the drink go toward the John Asher Memorial Scholarship Fund at Western Kentucky University. Asher was a journalist, a longtime Vice President of Racing Communications and spokesman of Churchill Downs who passed away last year at age 62. While it’s a general scholarship, Asher was champion of the school’s journalism program (he was honored with the Practitioner Award from the WKU School of Journalism and Broadcasting), so think of the money spent here as funding the reporters of tomorrow. Each drink is presented in a wooden box lined with jockey silks featuring the flask-shaped Woodford Reserve bottle. 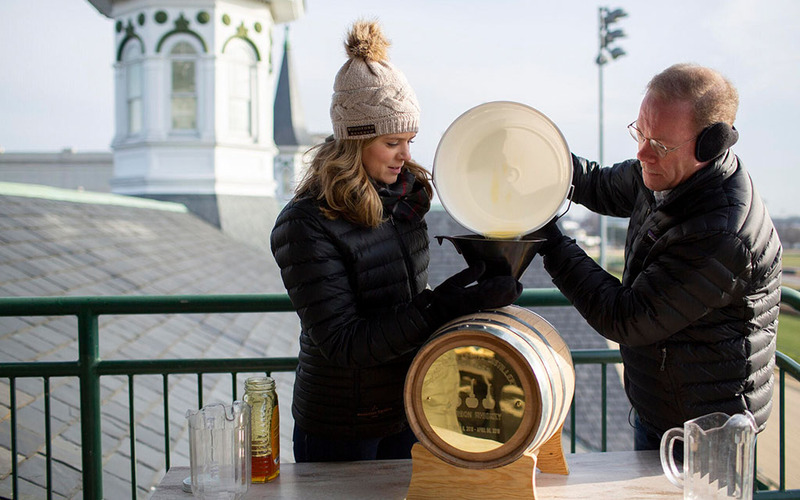 The cups themselves are handcrafted by a Louisville jeweler and adorned with “embellishments representative of the Best of Kentucky” and feature etchings of the Twin Spires and barrels reflective of the same vessels used to age the honey. You can buy the $1,000 silver cup juleps (and even a few $2,500 gold-plated cups) on May 4th at Churchill Downs, or you can order ‘em in advance here. If you want to make a variation at home, here’s the recipe (and when you’re done drinking it, send a $1K donation to your college journalism program of choice). We tried this variation at a tasting event a few weeks back with Woodford Reserve Master Distiller Chris Morris and Assistant Master Distiller Elizabeth McCall, and it’s amazing (the honey makes all the difference). Rub mint around the julep cup, expressing the essential oils and place the mint leaf in the bottom of the cup.Drizzle two bar spoons of honey sweetener in the cup, followed by two ounces of the bourbon, mixing the ingredients together. Pack ice into the cup, followed by placing the sipping straw. Layer loose ice on top, with a splash of Woodford Reserve Straight Bourbon to settle your drink. Garnish with shaved honeycomb and a sprig of mint.